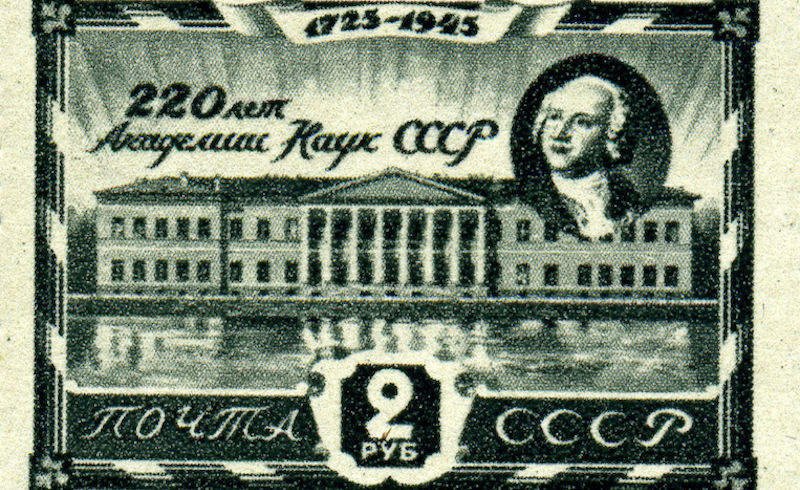 1945 stamp celebrating the 220th anniversary of the Russian Academy of Sciences. via Wikimedia Commons. Set 15 of our Radical Thinkers series brings together four classic works in the history of science. Helena Sheehan's Marxism and the Philosophy of Science: A Critical History, first published in 1985 and revised in 1993, offers a detailed survey of the Marxist philosophies of science developed in the hundred years between Marx's and Engels' work of the 1840s and the end of World War II. Below we present Sheehan's introduction to the first edition of the book. All our Radical Thinkers are 50% off until February 25. See more details here. In these pages, there unfolds a complex and intricate story. Although it is a story of the most vital significance, it has long been left untold. In some quarters this has been because of a total ignorance that there was anything to tell, and in other quarters because of a fear of the telling of it. It is the story of the shifting nexus of science, philosophy, and politics within Marxism. It is astonishing to discover in how many different ways and on how many different levels these have converged within the development of the Marxist tradition, both for better and for worse, with a multiplicity of factors coming into play, including the impact of new scientific discoveries, new philosophical trends and new political formations upon the overall process. While it is a story of a progressive and audacious enterprise, to which intelligent and discerning minds have applied themselves, it is also a story with its dark side, with retrogressive episodes, unscrupulous characters, hasty and ill-conceived projects, and superficial solutions, sometimes with dire consequences. This work attempts to give a historical account of the development of Marxism as a philosophy of science, as well as a philosophical analysis of the issues involved. This volume encompasses the first hundred years of the existence of Marxism, beginning with the mid-1840s when the philosophical ideas of Marx and Engels began to emerge in mature form, and ending with the mid-1940s with the dissolution of the Comintern and the end of the Second World War. It deals both with the mainstream of the Marxist tradition in the development of dialectical materialism as a philosophy of science and with the diverging currents advocating alternative philosophical positions. It shows the Marxist tradition to be far more complex and differentiated than is usually imagined, characterized by sharp and lively controversies for contending paths of development at every step of the way. The debates about how to develop Marxism as a philosophy of science have taken a number of forms. One recurring theme has been that of the precise relationship between philosophy and the actual results of the empirical sciences, debated in the sharpest form in the controversy between the mechanists and dialecticians in the Soviet 1920s. Another recurring theme has been the relationship of specific scientific discoveries to the philosophy of dialectical materialism, such as the controversies over relativity theory or genetics (the much cited “Lysenko affair"). Yet another theme has been whether dialectical materialism or alternative philosophies of science, based on neo-Kantianism, Machism, or mechanistic materialism, are the most appropriate development of the Marxist tradition, such alternatives having been put forward by the Austro-Marxists, the Russian empirio-criticists and the Soviet mechanists. There have also been debates about whether to develop Marxism as a philosophy of science, disputes exemplified most sharply by the emergence of the neo-Hegelian trend within Marxism and the dialectics of nature debate set off by the Hungarian Marxist Lukács in the Comintern in the 1920s and continuing into the 1970s. It all adds up to a formidable intellectual tradition in the philosophy of science which is virtually ignored by academic philosophy of science outside Eastern Europe. Certainly in the world of Anglo-American philosophy departments, insofar as there is any thought given to the history of the philosophy of science, in this era in which philosophy has become so woefully ahistorical, it is fixated on one line of development. The consensus undoubtedly is that the main dramatis personnae of nineteenth- and twentieth-century philosophy of science are such as Mach, Carnap, Popper, Kuhn, Lakatos, Feyerabend. This line of development has constituted the point of reference to which all commentators are expected to orient themselves, no matter how fundamental their criticisms of it, no matter how deep their commitment to charting a new way forward. I do not doubt that this line of development has been a vitally important one and that anyone working in this discipline without a thorough knowledge of the history of its major shifts and its present-day twists and turns would deserve harsh judgement from his or her colleagues. My point, however, is to call attention to the fact, too often neglected in this milieu, that this is not in fact the only major line of development in nineteenth- and twentieth-century philosophy of science. Another line of development, stemming from the very bold and original work of Marx and Engels, has been one with a very different relationship to both philosophy and science, but with, nevertheless, its own full-blown tradition in the philosophy of science — its own history, its own shifts, its own very fascinating twists and turns. However, no one is judged badly by his or her colleagues for being utterly oblivious of it and those who bother to think of it at all consider the sideward glances at Marxism on the part of Popper and Lakatos to be as much as it deserves, despite the fact that these forays have not been characterized by very full knowledge or very high standards of argument. Its history is known hardly at all and only the vaguest of caricatures of it prevail, with the name most readily connected with it almost inevitably being that of Lysenko. Lysenko has been part of it, to be sure, but so indeed have Marx, Engels, Lenin, Bukharin, Deborin, Bernal, Haldane, Caudwell, Langevin, Prenant, Geymonat, Hessen, Oparin, Fok, Ambartsumian, Kedrov, Hollitscher, and many others. Nor is it, as such names should indicate, simply an Eastern European phenomenon. It made, for example, significant inroads even into the hallowed Royal Society in 1930s Britain. Although these two traditions have struggled with many of the same issues, the basic rhythms of their development have been very different. The tradition stemming from Mach and the Vienna Circle arose out of the impulse to defend scientific rationality in the face of the challenges posed to it by new developments in science. In an atmosphere of crisis in the epistemological foundations of science, with all forms of rampant obscurantism feeding off this crisis, they strove to set science upon secure foundations. They sought to purify and cleanse the intellectual inheritance of the ages of all superfluous accretions, to clear out the slag of the centuries, to subject all belief to the clear light of reason and the rigor of experiment. They did so, however, from a base that was too narrow, employing criteria that were too restricted, leaving out of the picture too much that was all too real. Rigidly separating the context of discovery from the context of justification, the logical positivist and logical empiricist schools took only the latter to be the proper concern of the philosophy of science. The process by which a theory came to be was irrelevant to judgements on its validity. And, if psychological, sociological, and historical considerations were irrelevant, metaphysical considerations were worse than irrelevant. The striving for a comprehensive world view, giving rise to the great basic questions of the history of philosophy, was renounced in no uncertain terms. The trajectory of this tradition, from positivism to the current variety of postpositivist philosophies of science, has reflected the pressure of a complex reality upon conceptions too restricted to give an adequate account of it. The successive modifications of the tradition over the years, from verificationism to falsification, to the historicism of paradigm shifts, to the methodology of scientific research programs, to methodological dadaism, have been impressive but still inadequate attempts to come to terms with the metaphysical and historical dimensions of science. Despite such significant departures from the antimetaphysical and ahistorical heritage of the Vienna Circle, it still cannot be said that philosophers of science have yet brought to bear the full weight of the implications of metaphysics or historicity for science. Moreover, insofar as these dimensions have come into play, they have tended to do so in a negative way, in that they have been perceived as undermining the rationality of science. Many of the current debates are rooted in a persistent inability to reconcile the rationality of science with the metaphysical and sociohistorical character of science. In a strange way, the residues positivism linger on and color the views of even the most radical of antipositivists. And the flames of the crisis in the epistemological foundations of science bum more wildly than ever. There is no consensus, indeed there is exceedingly sharp polarization, regarding the relationship of science either to philosophy or to history. It has always seemed somewhat ironic to me that the most influential line of development in breaking with classical empiricism in the direction of a more contextual, sociohistorical, metaphysical view of science has come via Wittgenstein and Kuhn, when there were earlier bodies of thought already there, which had long since put forward far deeper and more radical critiques of the received view of science and far richer alternative versions. Both the radical empiricist tradition of James and Dewey and the dialectical materialist tradition of generations of Marxists have embodied attemative versions of empiricism (in the sense of seeing the origins of knowledge in experience), which were based on much richer notions of experience, which allowed the metaphysical and historical dimensions of knowledge to come more fully into play. Both rejected the formalist, individualist, particularist, passivist model of knowledge in favor of a more historicist, social, contextualist, activist model. The differences, however, are just as striking. Both of these earlier traditions placed science within a much wider sociohistorical context than did Kuhn and his successors. They understood far better the relationship of the history of science to the history of everything else, which undercut the possibility of such protected worlds-unto-themselves as Wittgensteinian language games, Kuhnian paradigms, or Popperian third worlds. Their field of vision opened to a much wider world. Their understanding penetrated to a much deeper historicity. Their modes of thought were much more integral and so they were not prone to the one-sidedness of later views. Their realization of the importance of hypothesis and deduction did not lead them to deny any role whatsoever to induction. Their awareness of complexity did not lead them to conclude that there were no unifying patterns. Their historicism did not entail discontinuity. Their acceptance of relativity did not imply incommensurability. Their renunciation of the quest for certainty did not bring them to despair, to announcements of the “end of epistemology,” to declarations that “anything goes.” What is really most striking about these earlier thinkers is how much more robust they were; how much more able they were to live in an open, uncertain, unfinished universe with many risks and no guarantees; how much more willing they were to stake their lot with uncertified possibilities. Nothing in all that they knew about what a complicated and uncertain activity science was stopped them from taking their stand with science and even drawing farreaching conclusions from it. Here I leave to someone else or to another day the task of making the case further for the radical empiricist tradition of American philosophy. This book and the one to follow will hopefully make the case for Marxism. Given the tensions wracking contemporary philosophy of science, it could well be of value to look back on a tradition that has proceeded with the same quite crucial matters, but in such a different way. The most significant features of Marxism in respect to these problems are: (1) that it has seen scientific theories as inextricably woven into world views; (2) that it has made extraordinarily strong claims regarding the sociohistorical character of scientific knowledge; (3) that it has not tended to perceive these aspects as being in any way in conflict with the rationality of science. Marx and Engels saw the history of science as unfolding in such a way that science was a cognitive activity carried on within the framework of a whole world view, which was in turn shaped by the nature of the socioeconomic order within which it emerged. Such a characterization of science took nothing away from science in their eyes. The science of the past, grounded in the world views of the past, grounded by the relations of production of the past, had all been necessary stages in the evolution of human understanding. It was necessary to unmask the superseded ideologies of the past and present that distorted the development of science. Even more, it was necessary to move the process onward to the next stage: the further development of science, in the context of a new world view, in the context of a struggle for a new social order and new relations of production. From the beginning, the Marxist tradition bravely set itself the task of elaborating the philosophical implications of the sciences of its times with a view to working out a scientific Weltanschauung adequate for its epoch. Engels's antipositivist materialism was an extraordinarily impressive achievement. He did not shrink from the great basic questions that have perplexed the philosophers of the ages, but he did insist that attempts at answers be grounded in the best empirical knowledge of the time. In so doing, he not only laid the foundations of a scientifically grounded world view, but set forth views on many issues, such as reductionism, the history of science, and the logic of scientific discovery, that not only anticipated certain contemporary theories, but are still in advance of them. Throughout its subsequent history, there were new challenges to meet, arising out of the revolutionary advances in the natural sciences as well as out of the emergence of new philosophical trends and new political formations, and these giving rise at every step along the way to new controversies, new arguments for contending paths of development. It is a complex tradition, with Marcuse or Colletti as far from Engels as Feyerabend from Carnap. Some of these contending paths involved explicit renunciation of Engels’s enterprise of striving for a comprehensive world view grounded in science and in continuity with the history of philosophy. There have been, for example, the Soviet mechanists who believed that science could do very well without philosophy, as well as Marxists of the neo-Hegelian variety who have tended to think that philosophy should keep its distance from science. Today, the interpretation of Marxism as a Weltanschauung tied to the development of science is by no means an uncontested position. It is no secret that there are today many contending schools of thought, all claiming to embody the correct interpretation of Marxism, some of which explicitly renounce the ideal of a Weltanschauung and display a marked hostility to the natural sciences, while others make a fetish out of an eccentric concept of science and tend to take a derogatory attitude to philosophy. Nevertheless, the mainstream of the Marxist tradition has defended the sort of synthesis of science and philosophy that Engels proposed, even it has not always proceeded in the best possible way to bring the project to fruition. The Marxist tradition has come forward with the fullest and most highly integrated claims to date regarding the socioeconomic basis of the rhythms of intellectual history. It is one of the most striking features of the story told in these pages just how tight its participants perceived the relation of science, philosophy, and politics to be, as far as both their own and their opponents’ theories were concerned. Marxism is therefore a tradition in which the relation of science to philosophy and of both to politics and economics is conceived of differently than in alternative traditions. The other traditions too have their socioeconomic basis, Marxists have argued, even if they have been unable to be fully self-conscious and explicit about it. Indeed, even the inability to rise to such self-consciousness and explicitness in this realm has a socioeconomic basis on this account. There can be no doubt that Marxism has given rise to a multifaceted and protracted struggle, both creative and destructive, to confront the philosophical problems raised by probing into the role of ideology in relation to science and philosophy of science. There is much to be learned both from the profound insights and from the tragic disasters born of passionate debates revolving around the tensions between partisanship and truth, between "proletarian science" and laws of nature. It still cannot be said, however, that the fundamental philosophical problem has yet been satisfactorily and explicitly resolved by Marxists or by anyone else. The underlying question, still to be sharply answered, is: How can science be the complex, uncertain, precarious, human process that it is — inextricably bound up with all sorts of philosophical assumptions and with all sorts of wider sociohistorical processes — and still be reliable knowledge of nature? The story set out here does not give that question the sharp, clear, fully argued answer that we feel that it needs, but it does give much in the way of promise and indicates that the resources for that sort of answer may well be there. In proceeding with this question ourselves, of course, we need to do our own thinking, but we should do it with a grounding in the best insights that all available intellectual traditions have to offer. The polarization, for or against Marxism, has been a formidable barrier to the sort of recriprocal interaction that could bear fruit. This raises a recurring problem in the history of Marxism, i.e., the relation of Marxism to non-Marxist trends. This, it must be said, is a problem that Marxists have not always handled very well. Most have unfortunately gone to the one extreme or the other, either accommodating themselves too far in the direction of recurrences of modes of thought superseded by Marxism and compromising the very distinctiveness of Marxism beyond recognition without sufficient reason for doing so or considering Marxism a closed world, with nothing to leam from other schools of thought and heaping abuse and invective upon anyone who has suggested otherwise. The traditions of Russian Marxism, with its tendency to identify opposition with treachery, and with its decided inability to be fair-minded towards opponents, has exercised a disproportionate influence in the latter direction. Even Lenin, who learned far more from non-Marxist ideas and was far more broad-minded than the subsequent generation of Russian Marxists, was notoriously unfair to Mach and Bogdanov. With lesser men, the exaggeration of the worst aspects of this tradition, backed by the powers of the NKVD (The Peoples Commissariat of Internal Affairs, the Soviet security police from 1934 to 1953, the predecessor of the KGB), has had disastrous and harrowing consequences. This has resulted in a hardening of the lines of debate between a fixed “orthodoxy” and a traitorous or martyred (depending on one’s point of view) "revisionism." This has led, on the one hand, to an unhealthy pressure against creative thinking and to a sterile adherence to fixed formulations. A nearly pathological fear of revisionism has obscured the fact that every tradition with the vitality to endure has revised and must continually revise itself with the onward march of history and with the progressive achievements of human knowledge. Marxists must judge matters on the basis of the evidence, on the basis of truth criteria established by the highest level of development of scientific method at any given time, and not on the basis of conformity or nonconformity to established Marxist premises, no matter how fundamental. Only if its most basic premises are continually scrutinized can the continued affirmation of them be meaningful. Of course, if really basic premises could no longer be affirmed in this way, then it would be legitimate to query whether the new position should still be considered Marxist. But only by being open to this possibility, by following Marx's own advice to question everything, can Marxism be adhered to and developed in a healthy way. Nevertheless, the various "revisionist" positions bear a closer look than they have tended to get, either from those who have dismissed them out of hand or from those who have glorified them uncritically. Those, such as the early Lukács or the various Marxists of the Second International, who sought to bring back into Marxism the neo-Kantian dichotomy between history and nature, were, it could be argued, reverting to an antithesis already transcended by a higher synthesis. It meant dropping something crucial to Marxism as a higher and more integrated mode of thought. It did, however, highlight certain problems within Marxist thought, that is, the relationship between freedom and necessity, the relationship between the role of critical thought, ethical norms, and revolutionary activity on the one hand and the role of science and causal laws on the other. These were aspects of Marxist thought that needed to be clarified or further developed with the decline of the liberal idea of progress, the more problematic character of science, the turn from materialism with a new balance of class forces as the bourgeoisie turned from an alliance with the proletariat against the feudal aristocracy to making their peace with the right against the forces rising against them on the left. In the same way, the Machist interpretation of Marxism may have brought back a subjectivism superseded by the Marxist unity of subject and object, but it did reflect very real epistemological problems raised by the new level of development of scientific knowledge. It called attention to questions that needed to be posed and answered in a new way, on the basis of new knowledge and at a new level of sophistication. The history of Marxism insofar as it is written at all is, for the most part, written along the above lines. There is, to be sure, a healthy tradition in Marxist historiography, represented by such writers as Eric Hobsbawm, E.P. Thompson, and Christopher Hill, though little in the field of philosophy or philosophy of science. Bearing on this problematic under study here, there is very little that is relatively free of the above patterns of interpretation, the most notable exception being Loren Graham's Science and Philosophy in the Soviet Union (London, 1973). Graham, although not a Marxist, has given an extremely fair assessment of Soviet philosophy of science in a sympathetic but critical vein. But almost all comprehensive or partial histories of Marxism bearing on philosophy and philosophy of science fit into the above categories, mostly into categories three and five. George Lichtheim's Marxism: A Historical and Critical Study (London, 1961) fits into the third category and only really covers the period to 1918, with only a sketchy and heavily caricatured concluding section dealing with the subsequent period. Gustav Wetter's Dialectical Materialism: A Historical and Systematic Study of Philosophy in the Soviet Union, complete with imprimatur and nihil obstat, falls into the fifth, as do a number of other such works written by neo-Thomist sovietologists, though it must be said that these are valuable as source material, the standards of scholarship being quite high, despite premises that rule out the possibility of sympathetic analysis. The most ambitious and seemingly comprehensive work to appear has been Leszek Kolakowski's three volume Main Currents of Marxism (London, 1978), a curious blend of the thinking associated with the third and fifth categories, reflecting the author's own growing dissociation with Marxism. The perspective from which he now seems to judge it all has been aptly described by Wartofsky in his review: "Between God, despair, and peaceful meliorism, Kolakowski offers no decisive choices, though he flirts with all three." 5 Whatever the merits of Kolakowski’s work, and merits there are, it suffers severely from his inability to give a fair account of positions with which he disagrees. There are also significant gaps that make it far from comprehensive. So too with David McLellan’s Marxism After Marx (London, 1979) which falls roughly into the third category and which is lacking in proportion and perspective and full of omissions and interpretations somewhat off the mark. As for those connected with categories one, two, and four, there are inhibiting factors against writing such histories. In the case of the first and second, there is simply too much material in existence contradicting these interpretations and such efforts that forge ahead despite this are a combination of evasion or blatant fabrication. The most crass example was the famous Stalinist History of the CPSU(B): Short Course (Moscow, 1939). A more recent, toned-down, example is Mikhail Iovchuk’s Philosophical Traditions Today (Moscow, 1973). The fact is that the history of Marxism has taken certain turns that present special problems in the matter of Marxist historiography. The history of Marxism is for many reasons dominated by the history of the communist movement. While noncommunists, for the most part anticommunists, have found this history almost impossible to comprehend, producing extremely distorted accounts of it, communists themselves have not helped much. For the stark truth of the matter is that communists have found it exceedingly difficult to be honest about their own history. (It must be said, however, that Western European communists have made serious efforts to overcome this in recent years.) Chapters four and five will try to give some indication why. In all events, precedents were set in the most deplorable degradation of intellectual life: Stalin’s denunciation of "archive rats," followed by a wave of denunciation of "rotten liberalism" and "bourgeois objectivism," purges, false accusations, insincere self-criticisms, arrests, executions, books disappearing overnight from bookshops and library shelves, names becoming unmentionable, photographs being doctored, NKVD requisitioning of archives, blatant lying. The days of such massive purges, arrests and executions may be over, the days of NKVD destruction of archives may be over, but the legacy of which these were a part is with us still. There is still much evasion and deceit. Casting its shadow over the academic life of the socialist countries and the intellectual life of some of the communist parties, there is the official history of Marxism, shallow, schematic, triumphalist, full of semiceremonial phrases, empty jargon, hollow self-praise. Below it, the real history of Marxism, in so far as it is known, leads a subterranean existence. Names, unmentioned in public, are whispered in quiet places. The story can be told in bits and pieces, but it cannot be published. Such books as Roy Medvedev's Let History Judge (London, 1976) and his brother Zhores Medvedev's The Rise and Fall of T.D. Lysenko (NY, 1969) have come as a breath of fresh air, given prevailing conditions, in that they have spoken loudly of much that is only supposed to be whispered and have faced the difficult personal consequences of doing so. Although admirable books in many respects, they do not escape the assumptions of the second category, putting an exaggerated emphasis on the personality of Stalin and failing to give due attention to other operative factors. 1. While I feel I can trace a certain mainstream flow of the Marxist tradition, I find it to be far from an unproblematic straight line and I believe the various currents diverging from it must be analyzed respectfully and seriously as highlighting very real problems. (Parenthetically, let me explain that I have used the word Marxist in a fairly liberal sense, at least on the historiographical level, including virtually everyone who called themselves Marxist and situated their problematic within the Marxist tradition. I have, however, on the philosophical level, tried to show the inconsistencies of many such positions and the discontinuity of certain of their premises with certain features essential to Marxism as a distinctive intellectual tradition.) Moreover, I have defied the existing conventions, mentioned the unmentionable names, delved into delicate and difficult matters that others believed should be let lie. I have done so regretfully, even sorrowfully, for I could take no joy in the self-inflicted tragedies of the communist movement, as do anticommunist writers who are, for the most part, the only ones who write about such things. But, shaken though I sometimes found myself, I could not turn the other way, for I disagree totally with the premises underlying the tradition of sacrificing truth to "partisanship," in the name of which so many crimes against science and against humanity have been committed. The only justification for socialism can lie in arguing for its truth and its humanism. If so, truth, morality, and partisanship should coincide. Indeed, there have been truthful and moral communists, such as Gramsci and Caudwell, and no less partisan (in fact more so) for that. 2. I do not think this history would be an unproblematic straight line but for Stalin. While I admit his shadow looms very large over it and I have tried to assess his role in it, he was after all only one man and there was much happening. 4. To the Althusserians, I must confess to being an unrepentant historicist. (I realize this term is a slippery one, with a wide range of usage. I use it to designate thinking pervaded by a deep sense of temporal process, which insists upon the value of genetic, historical, and causal explanation, though not in opposition to structural, logical, or systemic explanation. So specified, it is a way of thinking antithetical to the Althusserian way, although it is not Althusser’s own rather eccentric use of the term.) My argument is quite simply that we cannot separate human thought from the movement, the flow, the context of human thinking without thoroughly distorting what it actually is. The unfolding of history has formed us as what we are and shaped our modes of thought and there is no understanding any of it without a sense of the process that has brought it into being. 5. Far from believing Marxism to be the illusion of the epoch, I believe that, however problematic it has become and whatever criticisms may legitimately be laid at its door, there is still a point to Sartre’s statement that it remains the unsurpassed philosophy of our time. 10 Even if it be surpassed, and I am prepared to think that it may be, we shall still owe it much. For the time being, such features as its comprehensiveness, its coherence, and its orientation towards science still recommend it beyond any of its contenders so far. It is my view that the history of Marxism needs to be seen as a complex and intricate story of persons, ideas, and events; as a process in which philosophical ideas have emerged and contended with one another in a complex and multifaceted interaction with the social, political, economic, and scientific forces at work at any given time. It needs to be viewed with a sensitivity to the passionate striving, to the astute analyses, to the intelligent and enduringly valid syntheses it has brought forth and, at the same time, with a willingness to look full in the face upon the dark side of it and to realize how and why it is that those who love wisdom need to walk warily, even among those who are supposedly of their own kind. Regretfully, I am hard put to cite examples of work in the history of Marxist philosophy that meet these criteria — works that are comprehensive and sweeping, striving to bring into play the full network of interconnections, alert to the overall patterns of development, yet without sacrificing concreteness, thoroughness of research, or rigor of analysis; works that are sympathetic but critical. This, at any rate, is the challenge I have set for myself. It is for others to judge the extent to which I have met it. No doubt, I have fallen far short of what could have been done, given the complexity of the problematic with the immense possibilities it opens up and given the fact that it is nearly uncharted territory. Not altogether uncharted, however. Although there is no overall history of Marxist philosophy of science, there are some rather good histories of certain episodes of it. The only area in which major works are already in existence, however, is in the history of Soviet philosophy of science, the most notable works being David Joravsky's Soviet Marxism and Natural Science (London, 1961), which covers the period from 1917 to 1932, and The Lysenko Affair (Cambridge, Mass., 1970); and Loren Graham's Science and Philosophy in the Soviet Union (New York, 1973) the weight of which is on the postwar period, but which nevertheless contains much valuable material on the prewar period. These works are invaluable sources, adhering to the highest standards of scholarship, and I have not hesitated to draw upon them in my fourth chapter. However, even in the field of Soviet philosophy of science, where such significant work has already been done, there are gaps to be filled and interpretative issues to be clarified. I believe that many of the facts and ideas set out by Joravsky should be seen in a somewhat different light. While basically I agree with Graham, I prefer to give greater weight to the political context in dealing with philosophy of science than he does. Regarding my other chapters, there are no such major parallel works. However, there are, in every case, in addition to the primary sources, a variety of types of secondary sources that touch on certain aspects of the chapter. About the work of certain authors, there is a voluminous body of secondary literature, but little or nothing about others. I have undertaken to review this secondary literature where it exists and to take a specific interpretative position. In cases of an extensive body of literature, where an exhaustive survey would be impossible, I have attempted to select in a representative manner, so as to indicate the overall range of interpretative patterns. In matters of ongoing controversy, such as that of the Marx-Engels relationship and that of the relationship of the Oparin-Haldane hypothesis to Marxist philosophy, I have weighed the evidence and argued a very definite position. In every chapter, my general method has been to sketch the relevant historical background, to outline the terms of the philosophical debates, to show their connections to other debates, to evaluate the various philosophical arguments put forward, to determine their significance within the history of Marxist philosophy of science as a whole, and to review critically the secondary literature. But that is only the roughest and most superficial characterization of the book's method. Working through it in detail and in depth has forced me to wrestle with a host of exceedingly intricate and thorny methodological issues. Perhaps the most important of these underlying issues concerns the relationship between the philosophical and the historical dimensions of this work. This is not an easy matter to discuss. It would be difficult enough if I only had to explain myself to those who believe as I do in the historicity of philosophy, and I mean a deep, internal, and constitutive historicity, rooted in the historicity of rationality itself. To those who know, and know deeply, why the history of the philosophy of science is essential to the philosophy of science, I would have problem enough defending what I have done and how I have done it. However, living as I do in a world full of analytic philosophers and Althusserians, nothing can be taken for granted, and if I wish to defend my method, my task is far more complicated. I fear, however, that I may be talking across insuperable barriers in trying to explain myself to those to whom the slightest hint of historical scholarship automatically lays one open to the charge of being "insufficiently philosophical" or to those for whom a "symptomatic difficulty" already declares the end result to be a nullity. Most philosophers today are utterly oblivious of the fact that philosophy or science is historical, except in the most trivial and superficial sense. Even when they do look at the history of philosophy or science they do so in such a thoroughly ahistorical and noncontextual way, that anybody could virtually have said anything at any time. In philosophy, the ideas of Plato, Aristotle, Descartes, Hume, Kant, Hegel, Carnap, and Quine are treated as discrete and interchangeable units, virtually independent of time and place, and generated in an autonomous activity with no necessary or integral connection to anything else. If temporal sequence or economic, social, political, or scientific developments are mentioned, it is only in an accidental or circumstantial way. It is exceedingly rare today to find a philosoher with a real sense of the flow, the movement, the process of the history of philosophy or science and with a vivid sense of its integral connection with economics, culture, politics, and science. The contrast is falsely drawn and the subversion he fears would be, in my opinion, no bad thing. I see no reason why the philosopher should not be a teller of stories and be fully a philosopher in doing so. Certainly coming to terms with the history of philosophy and the history of science is no diversion from being a philosopher and writing such history is a thoroughly philosophical task. It is true. In any case, it is quite clear to me that my own world view has in deep, complex and decisive ways shaped my telling of this story. I acknowledge this straight out. Although I have tried to be fair even in relation to positions with which I disagree, I have been no detached observer. Although I have not used the first person in my chapters, except in footnotes, or given an explicit declaration de foi at every turn, I have nevertheless made my position, which in many ways cuts across the lines of historical debate, plain. Because I believe my philosophical assumptions to be justified, I believe this has enhanced my historical account. Those who do not share my assumptions will not think so. So be it, for it cannot be otherwise. Nevertheless, those who share my assumptions will inevitably see ways I could have fulfilled my task better and hopefully those who do not will not find me too wanting in standards of scholarship and argumentation. It is, of course, one thing to analyze the integral connection of philosophy to history and context, and another to implement such an analysis in terms of philosophical and historiographical technique. Within my own terms of reference, this has meant a constant alertness, not only to all the forms of interaction in the shifting nexus of science, philosophy, and politics, but to all the levels of interaction within each of these forms. It has meant the need to show in each period and set of circumstances the effects of science on philosophy, of philosophy on science, of science and philosophy on politics, of politics on science and philosophy. But within each of these categories, there are many levels of effects. There is first of all the most obvious level — the effect of overt political events on the fate of individual philosophers and scientists. Thus, the tradition was deprived of any further work on the part of Guest or Caudwell when they died fighting in the Spanish Civil War, of Politzer or Solomon when they were executed by the Gestapo, of Gramsci when he died in prison, of Hessen or Uranovsky or Vavilov when they were swept up in the purges. On a slightly different level, a bit more complicated to assess, there are the effects of political transformations on the development of the disciplines of philosophy and science and the relations between them. Thus, the October Revolution opened to Marxism the resources of institutional power, bringing into the discussion of philosophy of science a great vigor and enormous scale that was highly valued as integral to the task of building a new social order, and then crushing it through shortcircuiting rational procedures with clumsy or vicious attempts to settle philosophical and scientific questions by administrative measures. There are many factors to be taken into account to comprehend the shift in Soviet intellectual life as the 1920s passed into the 1930s, such as the impact of the inauguration of the first Five Year Plan upon the changeover from bourgeois to "red" specialists, the function of the concept of "proletarian science,” with many new complications arising; but it was even then a society which at one and the same time put an unprecedentedly high social value upon philosophy of science, even while they brought to bear the dark and destructive forces that would overpower it. Also, roughly on the same level, are the various shifts in the whole style of the intellectual life of the communist movement corresponding to the various shifts in Comintern policy, especially the shift from the sectarian third-period war on "social fascism" to the more expansive period of the Popular Front. There are many further levels, with the various primary and secondary sources drawing all sorts of connecting links between political factors and philosophical and scientific ones, sometimes quite to the point and sometimes far from it, but all of them showing the truth of Haldane’s discovery that, while the professors may leave politics alone, politics will not leave the professors alone. Finally at the deepest level, there comes the problem of discerning just how the prevailing political milieu enters into the philosophical thought process itself and into the scientific thought process itself. Politics, itself rooted in and connected to economics in exceedingly intricate ways, mediates in the formation of ideologies that bind fundamental assumptions to class interests in exceedingly intricate (and hidden) ways. (I use the term ideology to indicate a system of interrelated attitudes, based on a specific system of values and ties to the interests of a specific social force. I am aware of the fact that Marxists are split on the use of the term ideology and I believe the more general, nonpejorative sense of the term is preferable to the one that associates it with false consciousness.) I do not believe that intellectual history follows upon the development of economic and political factors in simple and uncomplicated ways. The connections can be of an extraordinarily complex and subtle nature, with all sorts of complications arising from overlapping and countervailing tendencies. It is an area beset with difficulties, for it has been so littered with facile and even malicious tendencies to assert direct and simple one-to-one correspondences between ideas and classes. The left’s habit of writing off people and premises as "bourgeois" or "petty bourgeois" has all too often provided a refuge for those who have had neither arguments nor conscience against those who have and it has not been grounded in a proper understanding of the real class basis of patterns of thinking. It is an area in which it is necessary to proceed with caution, but at the same time it is an area that must not be avoided. At all events, I have tried to be sensitive to all the interconnections I could discover, both overt and subtle, both direct and indirect, both immediate and epochal. I have probed to uncover the relationship of various thought patterns to various class forces and to various stages of development. I have tried to understand what it is about the mode of existence of the bourgeoisie as a class that ties the social order under its hegemony to patterns of thought that swing between reductionism, dualism, and idealism. I have also tried to understand what it is about identifying with the cause of the proletariat that puts the stress on totality and makes materialism seem most appropriate philosophy. Marxism itself embodies its own explanation of this, being not only an integrated world view, but a critique of a social order that structurally inhibits the formation of an integrated world view and a theory of a new social order that is the necessary social matrix for an integrated world view. It renounces any disjunction of philosophy and politics as symptomatic of the intellectual fragmentation endemic to the capitalist mode of production and holds that the integration of all spheres can be achieved only in a new consciousness tied to a new mode of production. This being the case, no history of Marxist philosophy of science could be anything but superficial if it could not give some account of the historical convergence between the critique of dualism, reductionism, and idealism on the one hand and the critique of capitalism on the other, between a tradition striving to set out an integrated world view and a movement towards a classless society. The Marxist argument that the historical convergence is grounded in an integral and logical connection is a forceful and fascinating one. But the logic can only manifest itself historically and the argument can only be filled out in and through the telling of the story. 1. Marx Wartofsky, “Politics, Political Philosophy and the Politics of Philosophy,” in Revolutions, Systems and Theories, ed. H.J. Johnson, J.J. Leach, and R.G. Muehlmann (Dordrecht, 1979), p. 144. 2. The older Lukacs used this phrase in objecting to the tendency to take his own early work and that of others as offering the solution to the present-day problems of Marxism. Cf. the interview with Lukacs in New Left Review, no. 68 (July-August 1971), pp. 55–56. 3. The term is given a special meaning by Althusser and his followers. Cf. Althusser and Balibar, Reading Capital (London, 1970). 5. Marx Wartofsky, “The Unhappy Consciousness,” Praxis International (October 1981): p. 291. 6. Louis Althusser, Lenin and Philosophy (London, 1971), p. 56. 8. B. Hindness and P. Hirst, Pre-Capitalist Modes of Production (London, 1975), p. 312. 9. Robert Gray, Review of Rebels and Their Causes: Essays in Honour of A.L. Morton, ed. Maurice Cornforth, in Comment, 23 June 1979. 10. Jean-Paul Sartre, Search for a Method (New York, 1968), p. 30. 11. Thomas Kuhn, The Essential Tension (Chicago, 1977), p. 5. 12. György Lukács, Marxism and Human Liberation (New York, 1973), p. 126.